One would think a company that uses massive naval ships to recover thousands of kilometres of undersea cable was started by a marine engineer; someone with an affinity to the sea. But the truth is a little more unexpected. Mertech Marine was in fact, started by a Paarl farmer who asked a single question, and when he saw an opportunity in the answer, set in motion the actions that would take him from terra firma into unchartered waters. In 1999, van Wyk van Niekerk attended an auction at the Cape Town Harbour, hoping to perhaps find steel materials that would prove useful on his farm. He won a bid on a particular lot, which happened to include 21km of undersea analogue cable from a system that became redundant in 1993. Once he had stripped back the cable and saw the possibilities for recycling and repurposing the raw materials, van Wyk wondered just how much cable might be lying – unused – under the sea. this simple question was to be the catalyst that led to the ignition of van Wyk’s entrepreneurial spirit and ultimately, the formation of Mertech Marine. And then van Wyk had a crazy idea. What if he were to start a company that retrieved undersea cables, dismantled them and then resold the components to farmers and other industries that would benefit from access to the raw materials? Van Wyk went to speak to the one person he knew who shared his entrepreneurial genes and big idea way of thinking – his brother, Francois van Niekerk, founder of the Mertech Group. They spoke about the possibilities and decided to establish Mertech Marine. From the initial stripping of the original cable to the first retrieval mission, everything was a learning curve; there simply is no textbook on the subject. In 2004, the company entered into a contract with the original owners to acquire the SAT-1 cable connecting South Africa with England, which had been out of use since fibre optic technology came to South Africa in 1993. With the sale concluded, Mertech’s next task was to acquire a suitable vessel for the retrieval of their newly purchased cable. In August 2008, a cable ship of Orange Marine was chartered to recover a piece of the SAT-1 cable as a trial. Various challenges meant an extremely lengthy retrieval time and by the time the 350km of retrieved cable arrived back in Cape town, the copper price had dropped considerably amidst the credit crunch and any hope of a profit had vanished. However, Mertech Marine’s team focused on the positive. They had proven that retrieving and offloading the cable was possible. They had proven that their own-built dismantling machinery worked. Mertech Marine was in business! The components which are being recycled at present are cable, wire, copper, polyethylene and aluminium. At this point, Mertech Marine has already recovered and recycled 25 000 km of undersea telecommunication cable and attributed 875 000 metric tonnes towards the volume of CO² emission savings. Since 2009, Mertech Marine’s factory added two dismantling machines and a self-designed state of the art steel cable and wire factory. 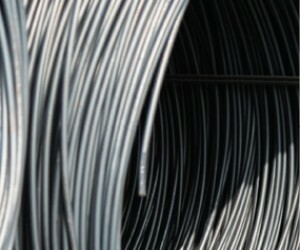 Steel components such as cable, wire, anchors (galvanised), droppers (galvanised), offset brackets (galvanised) and turn-and-pegs are marketed under the brand Mertech Cable and Wire, and offers an economical alternative for farmers building cattle kraals, erecting hail nets over fruit orchards, and for vegetable and vineyard trellising, and livestock and game fencing. Thanks to a stroke of luck, entrepreneurial vision and the tenacity of a farmer, Mertech Marine is today leading the way in sub-marine cable retrieval and recycling and continues to learn, grow, improve and pioneer. For more information, phone 021 981 8266, 081 549 1109 or 076 784 3205, or send an email to info@mertechmarine.co.za. Visit www.mertechmarine.co.za to learn more.